Olympic caliber equestrian show jumping, a boutique vendor village and family fun activities at one of the sport’s top venues—the American Gold Cup returns to Old Salem Farm in New York September 13—17! Now in its 47th year, the CSI4* attracts the top talent from across the country and beyond. This year, some 62 international athletes and 119 horses representing a total of nine nations from around the globe will be competing, including 2017 World Cup Final champion McLain Ward, Olympians Beezie Madden, Margie Engle and Mario Deslauriers, and 2017 European team gold medalist Shane Sweetnam. The third stop on the 2017/2018 Longines FEI World Cup™ Jumping calendar, AGC is one event that’s on every show jumping fans’ bucket list. 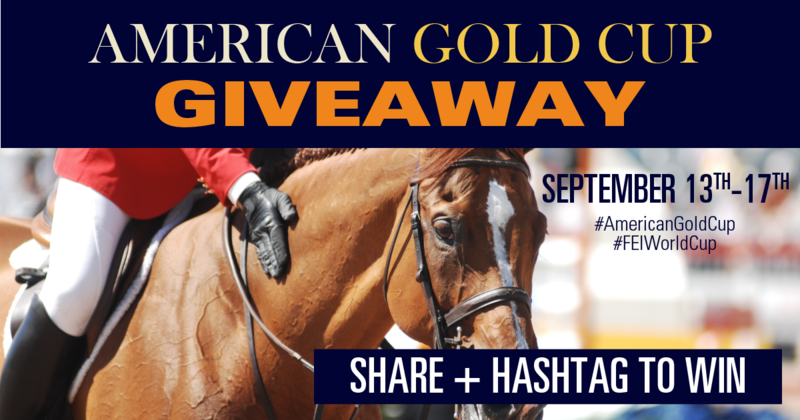 This year, we’re going to help 24 of you cross it off in the Ultimate American Gold Cup Giveaway! You and one lucky friend will join the Horse Network team in the “The Jockey Club” hospitality tent for a catered lunch overlooking the grass grand prix ﬁeld during Sunday’s $216,000 Longines FEI World Cup™ Jumping New York! PLUS, you’ll get an exclusive course walk before the class and two rider-autographed AGC Hats! Everything the show jumping fan needs to enjoy a day at the American Gold Cup and the souvenirs too! Two lucky winners will get General Admission tickets for themselves and a friend, plus an AGC t-shirt, hat and other souvenirs. Show jumping is always more fun with a friend! We’re giving away 10 pairs of General Admission tickets so you and your favorite horse friend can spend the day on us at the American Gold Cup! To enter, simply share or re-post the Facebook, Instagram and Twitter posts below. The more social media channels you use, the more chances you’ll have to win!